I took a bit of inspiration from Felicity's Christmas card with the ribbon treatment, and I was pleased to use another stamp set for the first time :). It's a bit hard to tell but the little bird is popped up on a dimensional as is the sentiment. Well, that's it from me today. Finally, it appears we are getting some warm weather, typical when I have to return to work on Monday :( Hope you have a wonderful day and weekend. Love your card Jo. Funny to read how you went about it....I too had Cheep Talk in my hand at the start of my card....as you can see I came up with something entirely different, as is quite normal for me. I can't seem to become a follower of yours. Any ideas? like you said great minds - lol! 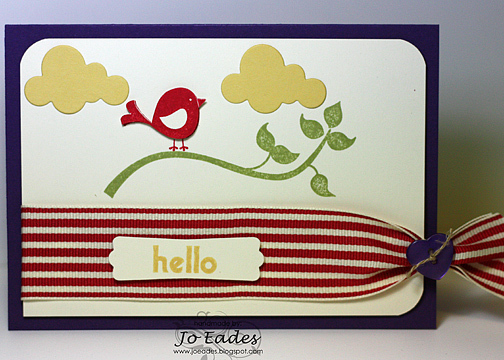 I do love your ribbon treatment - will have to try that some time! Ohhh - cute clouds. And I just love that ribbon. I must get some more of it. It's so soft and yummy. This is so cute. I love how you've done the ribbon. I've finally got here to comment Jo! I love how you've used the colour combo to make such a clean, bright card. So gorgeous.